FashionYourLifestyle: What is a good follow-up? What is a good follow-up? As what all bloggers recommend, bloggers are more likely to be successful by writing more blogs as follow-ups. Follow-ups is not only for bloggers. It is the ingredient to anyone’s recipe to success or simply to get a project done. If every follow-up is done at its best with an attitude, I am sure it gets to the target much quicker. Practice could be the alternative to follow-ups. This is the topic much spoken during the recent family weekend we had. 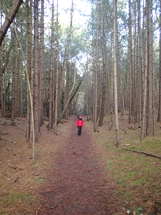 This last week weekend, we went to attend Xerox Hiking Group in Wells-next-the-sea in North, Norfolk Coast. The group stayed in Youth Hostel, simple but nice accommodation. We had a good time in spite of little things going wrong for me. The day we were traveling, I woke up fifty minutes past four in the morning with a migraine. With my husband’s help by making two cups of tea and bringing me paracetamol, and made the pain subsided. With a mind kept of drifting off and queasy stomach, I prepared for the trip. The travel was good. I survived! We arrived welcomed by old familiar faces, that I had missed for a year. Their smiles, made me feed all the effort of going through and all discomforts is worth it. Things can be different from what it appears. I was still not feeling well. The bed was more attractive to me than having a tipple with friends. I woke up great and had a generous serving of an English Breakfast. We packed. Half past ten, we walked towards the beach. The sky is gloomy over the beach with the displayed threat of rain. And so it drizzles as my son grumble on the raindrops on his face. The good thing we were well wrap-up by our weatherproof gear so he cannot complain of anything else. We started teasing each other and that distracted him from the weather on his face. He asked his waterproof mitten on. It looks like boxer gloves, that it gave him an idea to practice his “Three-Attack-Sparring with Jiyu Dachi Stance” Karate moves on us. That definitely warm us up and we had lots of fun until we reached the end of beach and about to enter the woods. Woodland after the beach? Yes, this landscape sound strange which can entice curiosity if we look at it positively. We did and we got a good surprise! The woodland only have two kinds of plants: lots of grass and Pine trees. The calming scent of the pine trees and sunshine coming through the gaps is so pleasant. Somehow it reminded me of deserts of Arches National Park of Utah. Too calm, I got a surprise! I just missed this pine cone by a second. It is as big as the ordinary male adult hand when closed. It dropped from a three-story high pine tree. My son took it home for souvenir. It was warmer on our way back to our accommodation. There is still daylight when we arrived. It was just passed three in the afternoon. It was a very gentle, calm, six-mile walk, with tiny surprises at the end. I am glad I had the walk. I am glad I heed myself about: “You need to go back to your exercises!”. The gentle stroll is just what I need gently ease back to healthy practices. When participating outdoor activities in autumn or winter (such as what we did), it is very important to have the right clothing. The only way to be comfortable in cold outdoors is to be warm enough you could still smile like having your own sunshine that radiates on people around you. Walk along the beach, woodlands or out of the city is good to get fresh air thus refreshes your whole being. Try not to miss such opportunity.